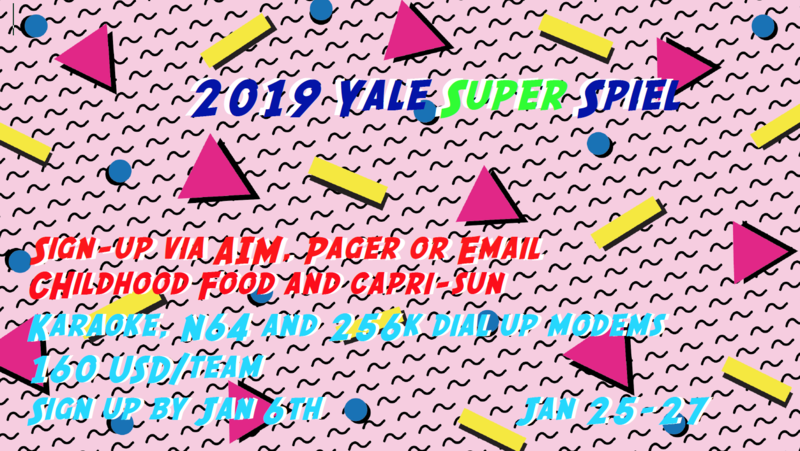 We are dedusting our N64, bulk-ordering Capri-Suns and putting on our neon-colourd sweat-bands to bring back childhood nostaliga at the 2019 Yale Super Spiel. Dress up in your best 90s outfit and win the costume contest, dance to our 2000s music and listen to our angelic karaoke voices. Play any game from boardgame collection. Articuno left its spots on Pokémon go and is preparing fast Nutmeg ice, and a flock of charmanders are warming up the warm-room and Brock has just delivered newly sharpened rocks from Pewter city. Nutmeg and the Yale Curlers cannot wait to host you. We are so excited to host upto 18 teams! It is easily accessible with a 56 kbit/s connection - we tried to write a script with fortran but we failed. We can host 18 teams. Apply for upto two teams. First teams are allocated on a first-come first served basis. Second teams will enter in a raffel if demand exceeds supply. We will make a separate annoucement for subsidised hotel rooms. We will send payment instructions, invoices and more information after we received your application. All games will live covered on YouTube with commentary. Like last year there will also be an online full live score. See you in no time in New Haven on Jan 25th - Jan 27th.